So what does all of this mean? 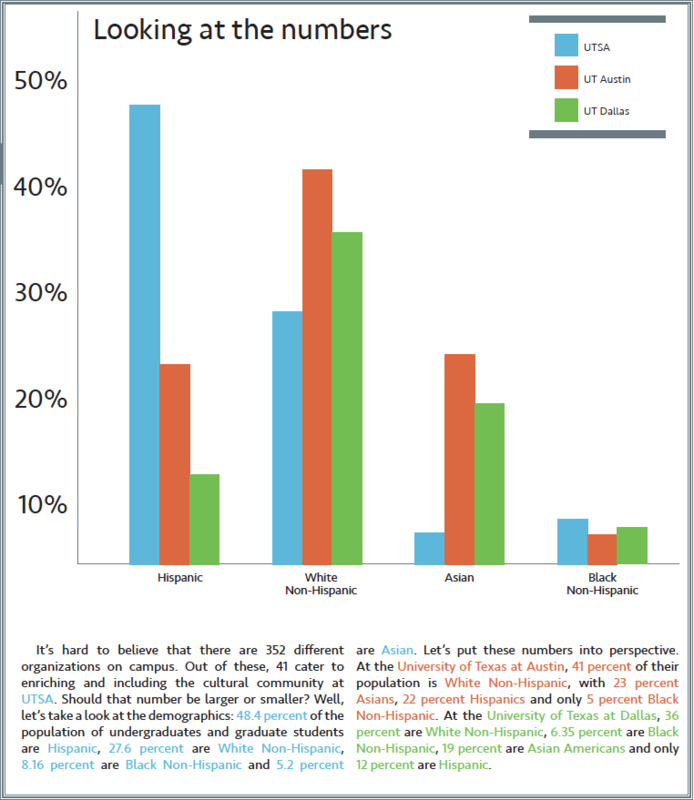 Clearly the statistics show that UTSA has a very high Hispanic population. But according to the majority of the students, it doesn’t seem that way at all. Yes, the numbers of Hispanic students are high, but as most of them live in San Antonio they spend very little time on campus, whereas most of the international students, hence the diversity, live on campus and are more visible. College campuses have definitely become a lot more diverse in the last decade according to the U.S Department of Education with the number of Hispanics and Latinos increasing from 1.8 million to 2.9 million. Statistics have shown that compared to the average college campus, UTSA is more diverse, just as students predicted. For example the University of Michigan’s demography is 4.6 percent Hispanic, 56.2 percent White Non-Hispanic, 4.1 percent Black Non-Hispanic and 11.2 percent Asian. This puts the demography of our university in a new perspective, where it can be appreciated.